P-M Heden of The World at Night took this photo from Uppsala, Sweden in Sept. 2012. This deep landscape shot required only a wide aperture and filter to boost contrast. One of the pleasures people can get out of stargazing is noticing and enjoying the various colors that stars display in dark skies. These hues offer direct visual evidence of how stellar temperatures vary. A good many of the summer luminaries — such as brilliant Vega which this week stands nearly overhead at around midnight — are bluish-white, but we can easily find other, contrasting colors there as well. Probably the most colorful double star in the night sky can now be found about two-thirds of the way up from the eastern horizon to the point directly overhead at 10 p.m. local daylight time: Albireo in the constellation of Cygnus, the swan, also known as the Northern Cross. Albireo supposedly marks the swan's beak, or the base of the cross. A small telescope or even a pair of steadily held binoculars will readily split Albireo into two tiny points of light of beautiful contrasting colors: the brighter one a rich yellowish-orange, the other a deep azure blue, both placed very close together. Astronomer Garrett P. Serviss referred to Albireo as "… unrivaled for beauty, the larger star being pale topaz and the smaller a deep sapphire." You can get an absolutely stunning view of the double star with a telescope magnifying between 18 and 30 power. Astronomers think Albireo is a physical pair, although they have never found evidence of any orbital motion between these two colorful stars. The projected separation between the two is just over 400 billion miles. At least 55 solar systems could be lined-up edge-to-edge, across the space that separates the components of this famous double star. Star colors are not easy to see chiefly because our eyes' color sensors — the cones of the retina — are quite insensitive to dim light. At night, the rods take over, but they are effectively color-blind. Only the brightest stars can excite the cones, unless binoculars or a telescope is used to intensify a star's light. Color perception is aided further by the close juxtaposition of a contrasting pair of stars as in Albireo. There is an interesting rule about the colors of telescopic double stars. If the stars of the pair are equally bright, they have the same color. If they are unequal in brightness, they have different colors. If the brighter star is the redder of the two, as in the case of Albireo, it is a giant star; if it is the bluer, then it belongs in the main sequence of stars along with the sun. 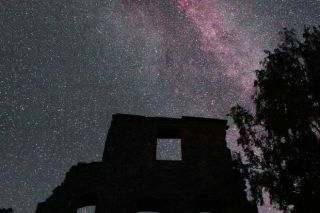 Editor's note: If you have an amazing night sky photo of any celestial sight that you'd like to share for a possible story or image gallery, please contact SPACE.com Managing Editor Tariq Malik at spacephotos@space.com.